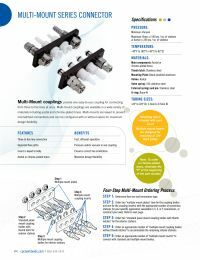 Multi-Mount couplings provide one easy-to-use coupling for connecting three to five lines at one time. Multi-mounts are available in either acetal or chrome plated brass and are keyed to prevent mismatched connections. Please Note: This specialty item from Colder has a minimum quantity order of 30 fittings.